For the second year, the Disneyland® Resort Dreamers & Doers program recognized nearly 100 Orange County High School students for their achievements and the difference they are making in their communities. 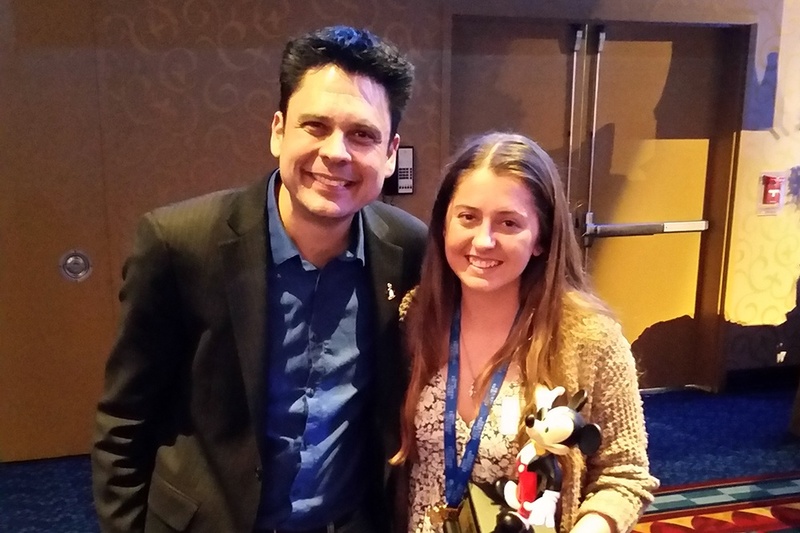 On February 25th, 33 students were honored as “Shining Stars” and invited to attend an educational symposium and celebratory luncheon at the Disneyland Hotel. During the symposium, students engaged in presentations on leadership and professional development, as well as activities focusing on collaborative problem solving facilitated by MIND Research Institute. One of the activities included Block Race, a collaborative math game where students contribute their blocks to teams, solve a sequence of mathematical problems, and learn the growth of numbers. 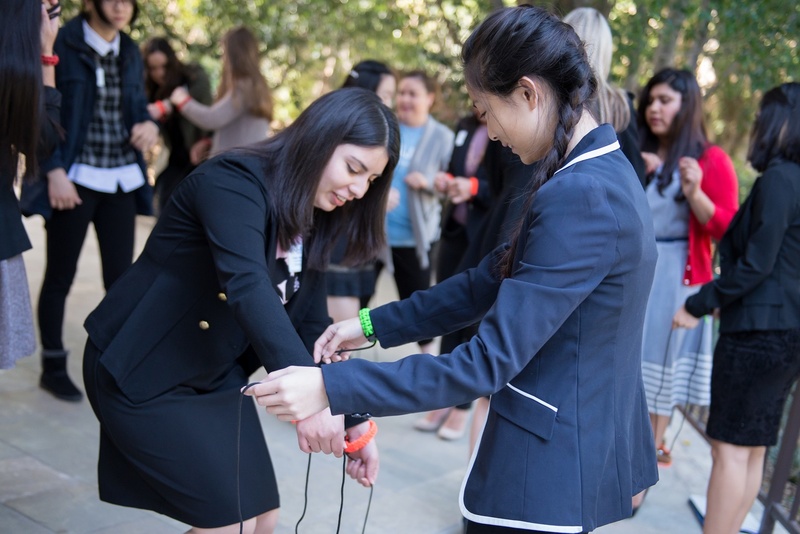 The other activity was Cuff Linked where two students get cuffed to each other and need to think outside of the box in order to be free from each other. Three other puzzles followed. These group activities allowed the students to interact with one another, problem-solve together, and provide a creative and innovative approach to learning. Students problem solve together to unlock themselves in Cuff Linked. "If You Are Not Making Mistakes, You Are Doing Things That Are Too Easy." Dr. Matthew Peterson, co-founder of MIND Research Institute and the creator of ST Math (featuring JiJi the penguin), was the guest keynote speaker during the luncheon. His keynote highlighted his personal struggles in overcoming challenges as a child, and how those struggles made him the innovator he is today. He inspired and encouraged students to continue their community outreach efforts by leading by example. His story about struggle shows how perseverance is one of the most important skills. “To all you Dreamers that become Doers; one thing that they do not tell you, is that you will make mistakes and that is okay. I have made many mistakes and continue to make them. If you are not making mistakes you are not doing enough, you are doing things that are too easy. You don’t want to make the same mistakes over and over; those are the mistakes you want to avoid. Five students were surprise-announced as the program’s top “Luminaries” for their exceptional efforts in creating a brighter tomorrow for the communities in which they live. One of those “Luminaries” happened to be a JiJi Alumni. She was so excited when she heard Dr. Peterson present and could not be more excited to thank him for designing this game that helped her understand mathematics when she was in elementary school. Sydney Fredette is a senior at Santa Margarita Catholic High School. She founded her school’s Be the Change Club, which has donated approximately $60,000 worth of goods to kids without permanent housing. She also leads the Beary Merry Christmas, a community club she started nine years ago. Sydney along with the other 32 students are a great example of how we can empower all students to solve the world’s most challenging problems. Congratulations to all! Thank you Disneyland® Resort for inviting MIND Research Institute to participate in the Dreamers & Doers Symposium facilitating the team building and collaborative problem solving activities. We enjoyed meeting the incredible Orange County high school students who were recognized through the 2016 – 2017 Dreamers & Doers program! Disneyland® Resort Dreamers & Doers celebrates the power of possibility and recognizes youth who take action to improve their communities, homes and schools. Applications for the 2017 – 2018 program will be available in September on publicaffairs.disneyland.com.